We’ve various forms of accommodation for the poultry residents of the Smallholdings and they seem to be getting more involved as the years pass. On Sunday I took my Godson Theo to collect the day’s eggs and he was delighted to have a total of four nest boxes to examine and nine fresh offerings to gather. The latest development, devised by James, is a twin-run system on the back of the main chicken coop (illustrated above). Our hybrids, dependable layers and industrious grazers that they are, decimate grass pretty quickly, so the enclosure that he’d fenced off for them in the autumn began to look rather bare a few weeks ago. Rather than giving them a larger area, James decided to create a two-way enclosure so the flock can run on one strip for a period while the other recovers (see above picture). 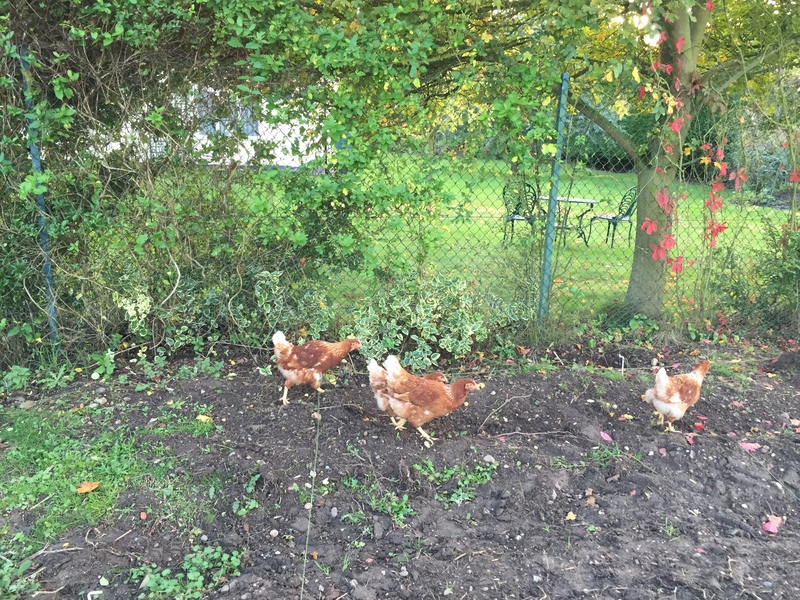 Cobbled together with an old gate that was out of use, and a roll of chicken wire, this simple solution involved annexing the current run with the same strip of garden, while the gate switches the girls from one side to the other once the grass has replenished itself. With access to fresh turf, the flock are producing the most fabulous rich-orange yolks as a result. Now the days are longer and warmer, too, we’re thriving on a plentiful supply, in various forms – poached, scrambled, boiled, baked, fried, and eggs are the star ingredients in a range of cakes as well as savoury dishes. I don’t think the novelty of taking a still-warm egg from the straw that lines a nesting box chicken coop will ever wear off. Happy henkeeping all! A very belated happy henkeeping year, one and all. As excuses go this is pretty lame, I know, but this whole month of tardiness is partly due to our seven-month old baby Charlie’s distaste for daytime naps. I’ve found it a little challenging to get household chores done, let alone blog posts and such. 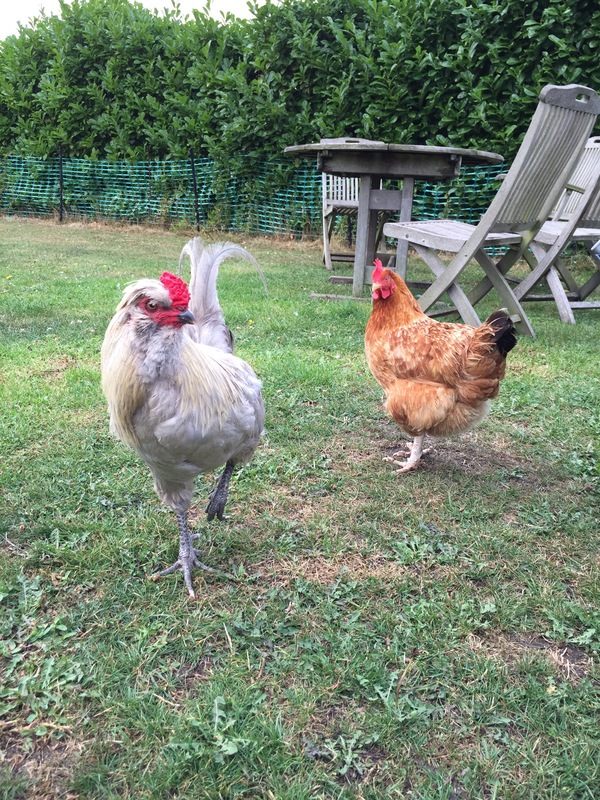 At the Smallholdings, 2016 has begun very promisingly – we’ve almost more eggs than we know what to do with. During most of 2015 it was a game scraping just half a dozen together a week, while friends and family waited patiently on the side lines for any spare freshly laid beauties our hens could muster. Now our newest brown hybrids are cracking out one each every day, so we feel positively egg rich. The old guard, based in the Henmobile, are still knocking out a decent supply, too, and are chaperoned around the garden at all times by Jeffrey, the handsome Araucana cockerel (pictured below). Whenever we fancy doing some poaching, scrambling, frying, baking or boiling there’s a whole line up on the kitchen worktop to choose from. So we’ve forgiven them for sleeping in the nest box, lining it with droppings, and just accepted their curious behaviour – as long as they’re productive, we’re happy to clean them out on a daily basis. What’s really remarkable though is that our silver-barred Araucana Margot laid the other week – almost a month before Valentine’s Day when pure breeds open up shop again. It was a pointy little number with a perfectly lovely yolk and white inside. There’s not been another from her since, so it was just a token offering, as if to say ‘I’ve still got it’. Love that hen! Suffice to say, the fruit cage still isn’t up and running yet, but our plants have arrived, including two beautiful-looking cherry trees for fan-training. I’ve heeled them in and almost finished digging over the ground. The next task is to mark out the beds, prepare the soil and erect the frame. It all needs doing by March, so there’s just a month left now. I need to pull my finger – or rather fork – out and get cracking. Anyone else planning a project for spring? Well, they were well worth waiting for. James discovered a clutch of five freshly laid beauties last week – but not in the place he expected to find them. Rather than in their own coop, our new cheeky brown birds had laid them on the floor of the henhouse belonging to our Araucanas Audrey and Margot. What these two lovely old girls made of it, I can’t imagine, especially as they don’t produce their own eggs between September and February. Most irregular. 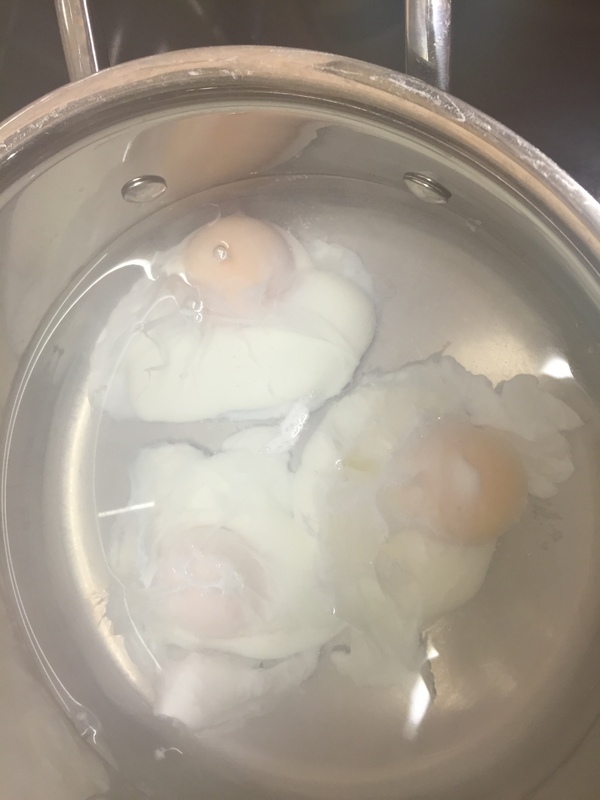 We didn’t spend too long wondering why the precious deliveries ended up where they did – instead, we made two divine omelettes for supper to celebrate. Boy, they were good. Since then, there’s been a steady supply of, on average, three a day. 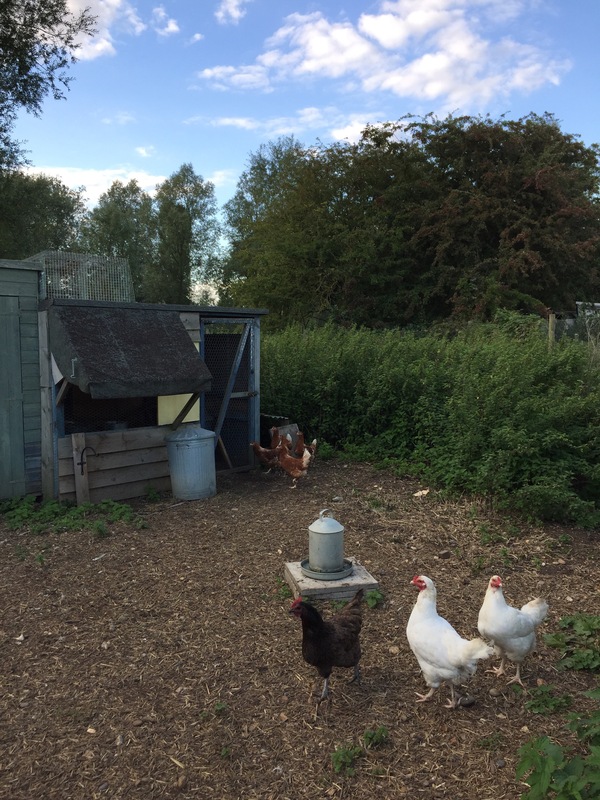 In order to keep the peace, James has relocated the new miniature flock to their own quarters – a dog kennel we converted into a chicken coop years ago with its own undercover and open runs. This way the rookies can lay only in their own house and, meanwhile, our older girls and Jeffrey, the Araucana cockerel, are enjoying the Henmobile and free-ranging around the garden. However, the young ones are still insisting on sleeping in the nesting box (and, naturally, leave a whole load of droppings in it) while, roughly, a third of eggs are laid while the girls perch, so end up smashed on the floor. They’ve also attempted to break into next door’s garden by scaling the hurdle fence between us – despite their wings being clipped! This has come at a time when we are attempting to simplify many aspects of our lives, which includes installing automatic pop-hole openers so our various flocks rise with the sun and don’t wait for us to let them out and they are shut up at dusk if we are out. 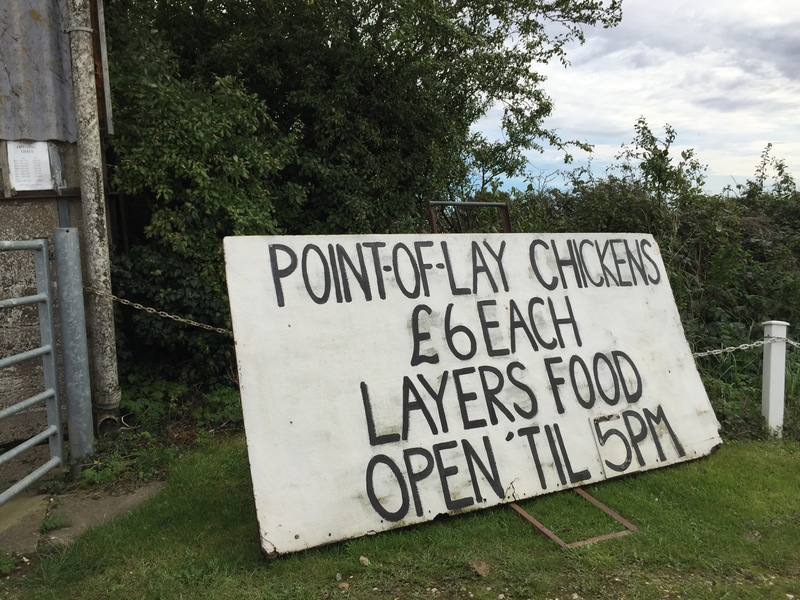 Perhaps buying these chickens from a big farm rather than our usual supplier was a false economy – as we had to wait several weeks for them to come up with the goods and many are damaged before we collect them, plus there’s the extra cleaning out to do. Their eggs, however, are so good that we are inclined to overlook their shortcomings and be consoled by those rich-orange yolks. The five point-of-lay hens we picked up almost a month ago have proved to be fascinating characters. It would seem they aren’t quite ready to rustle up any much-needed eggs for us and our nearest and dearest, but that’s often the way with birds you buy in at that age. And four of them roam the garden together while the fifth is a lone ranger. But it’s their lack of interest in perching that is rather more interesting at present. When we collected them, the farmer told us they were a new kind of hybrid, fresh on the farm. We wonder if they have been specially formulated for the intensive poultry industry, ie enriched cages, which are an improvement on battery conditions, but still do not allow as much natural behaviour as free-range systems. Every evening, James would find all five of them bundled on top of each other in one nest box (they had three to choose from). This must have been mighty cosy, but it was also a little messy as chickens produce most of their droppings at night. It was as if they didn’t like the space available to them or that they simply didn’t know how to roost, so he would take them one by one to place on the perch alongside the rest of our flock, in the hope that they’d finally get the message. This week, growing tired of the nightly ritual, he struck on the perfect solution. 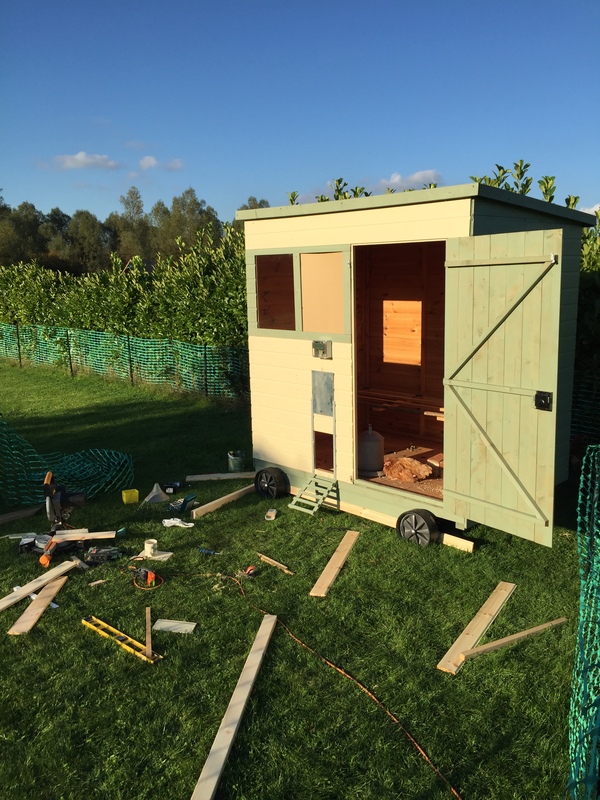 He would finish our Henmobile, the shepherd’s hut-style coop we began constructing from a shed almost a year ago(! ), which currently has no nest box for them to sleep in. The accommodation would also prove a suitable retirement home for our oldest brown bird, who has been bullied by the rest of the flock – she was chased into the nettles by some of the youngsters just last week (a reminder of how unpleasant these generally adorable creatures can be). She’s already taken to her new des-res, keeping James company while he gives the place the finishing touches (pictured below). Little ladder made, perches installed and automatic pop-hole wired up, we introduced the livestock and crossed our fingers. 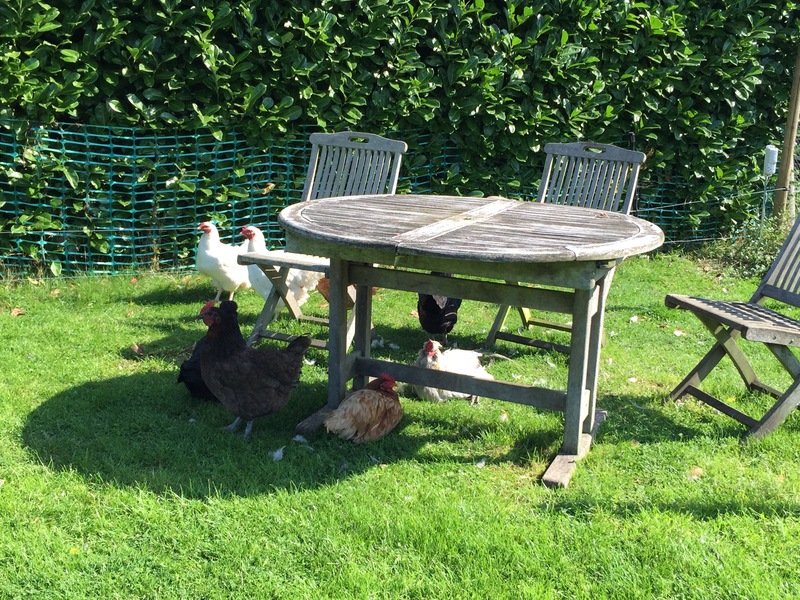 Hurrah – the young hens are perching a treat, and the veteran is showing them the ropes and thoroughly enjoying her retirement. There’s just the nest box to make (by which time, we hope the girls have got the general idea: that it is for laying eggs in), and we need to create a lean-to shelter where the flock can keep out of the worst of winter weather. But the Henmobile is finally up and running. James has so enjoyed tinkering with it and practising his carpentry skills that I wouldn’t be surprised if it’s inspired a whole new enterprise. An old adage about not counting chickens until they’ve hatched springs to mind, however. Happy henkeeping all. In a bid to up the Smallholdings’ egg yield, James and I decided to buy in some standard brown hens last week. These no-nonsense birds should ensure that we can soon give away and sell the odd box – the lack of such a service over the past few months has proved rather a disappointment to our various egg enthusiast relatives and friends. And we’ve even found ourselves having to buy them, which really goes against the grain. Still, there’s nothing like a lack of freshly laid beauties and the watery whites and small, pale yolks of shop-bought imitations to highlight just how worthwhile it is to keep hens. Most of our girls are now either pure breeds (and therefore not laying until mid-February time) or past production age and enjoying a well-earned retirement. We’d intended to wind-down our flock until the girls and Jeffrey were installed in the Henmobile (a shepherd’s hut-style house on wheels that James began making out of a shed a while back), but that mini project has, naturally, taken a back seat while we focus on finishing our own house before our four-month-old baby Charlie becomes a toddler and discovers a variety of all-too-rustic bits of unfinished plaster and wooden surfaces around the place. So, we couldn’t wait any longer for some new layers – and nor could our recently-deprived band of customers. Anyway, to our delight, three of the new layers laid an egg each yesterday – our first for what feels like weeks and weeks – so James and I celebrated last night with an all-day breakfast in which they were the centrepiece. A trio of beautifully poached numbers to delight the eye and the palate starred in the quite delicious teatime treat. What more could one want? Happy henkeeping all. Inspired by the urge to grow as much of our own food as possible, I bought a whopper of a fruit cage five years ago. I’m ashamed to say that all 18 x 24 feet of it has lived in the barn ever since. At the time, James and I were still in the midst of renovating our now-nearly-finished home and spending our time furnishing our garden with berries wasn’t very realistic. Consequently, we’ve been seriously lacking in the soft fruit department ever since. 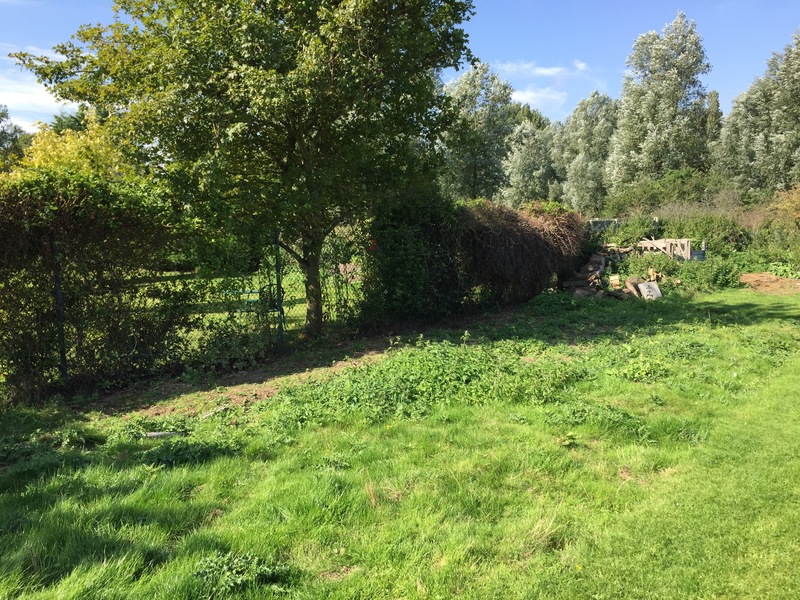 So, this autumn I’m determined to make amends and establish this important part of the Smallholdings plot. 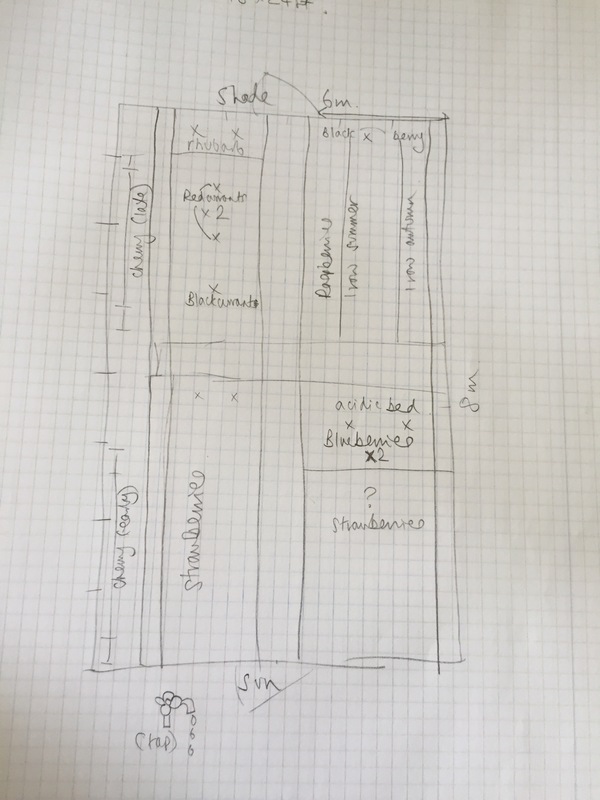 Not being particularly knowledgeable in this area, though, I called on an expert gardener friend of mine, Lucy Chamberlain, former editor of Grow Your Own magazine and all-round-greenfingered guru to help me plan this not-inconsiderable exciting new space. As usual, Lucy was full of excellent advice – recommending where to site each kind of plant so they get the best possible conditions in our south-east facing garden: full sun for strawberries; shade for the blackberry and rhubarb. Trouble is, not sure I’ve a skill to offer Lucy in return, but a pub lunch is definitely in order. I’m thoroughly looking forward to getting stuck into this new, mouthwatering project when the plants arrive. In the meantime, James and I have our work cut out preparing the ground (above) – what better way to spend these sunny autumn days than weeding and digging over a patch of soil? As we’re yet to test them, perhaps we’ll call on the ploughing capabilities of his vintage tractor… Happy weekend all. Since we confined Araucanas Audrey and Mabel to their run in an attempt to gain back our porch (where they spent most of their time and left the majority of their droppings), our cockerel Jeffrey has been pining for their company. From the other side of the chicken wire, he’s crowed and they’ve clucked, while we’ve been feeling rather guilty at causing the separation of this curious love triangle (but enjoying the lack of chicken poo on the soles of our shoes a little more). However, it seems Jeff’s an adaptable fellow and has struck up a new romance with an older woman. It’s our cheeky brown that’s caught the rooster’s eye. 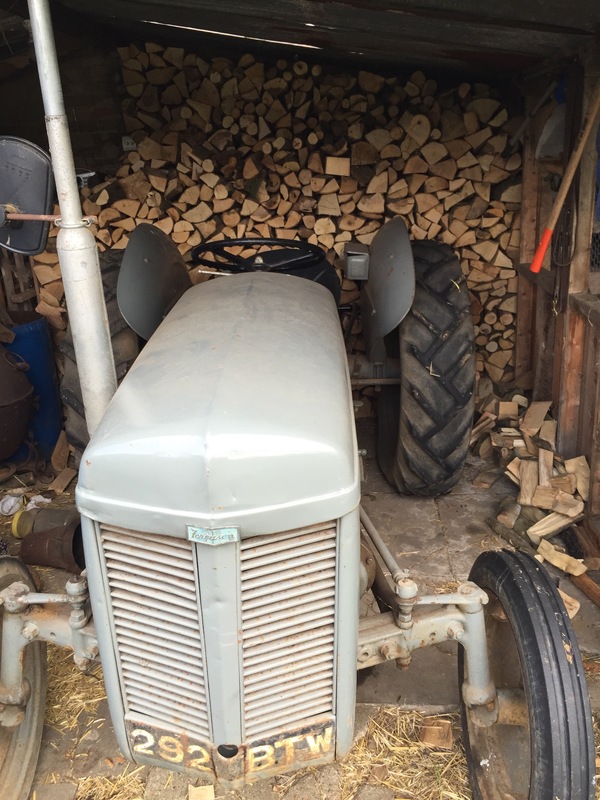 Just as he did with Margot and Audrey, Jeff’s been taking a turn around the garden with this lovely old girl over the past week or so, giving her a new lease of life it seems in the process. He’s been crowing even more than usual and at all times of day – declaring his new passion perhaps…? And she’s been showing an interest in our house and even looked as if she was going to take advantage of the open French windows the other day and hop into the kitchen. In all the time we’ve had her, she’s never once attempted to make herself at home. What is it about Jeff’s birds? 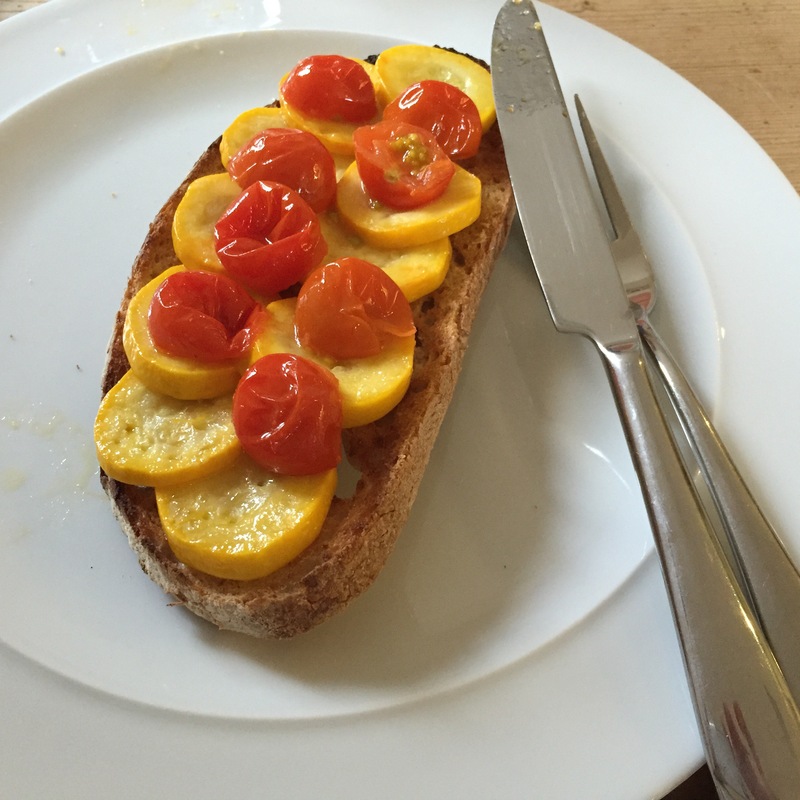 Other little happenings at the Smallholdings this week include picking lashings of tomatoes and courgettes – we enjoy making little dishes out of our modest harvest. I rarely think to rustle up a starter for James and I, but bruschetta before dinner has gone down nicely. 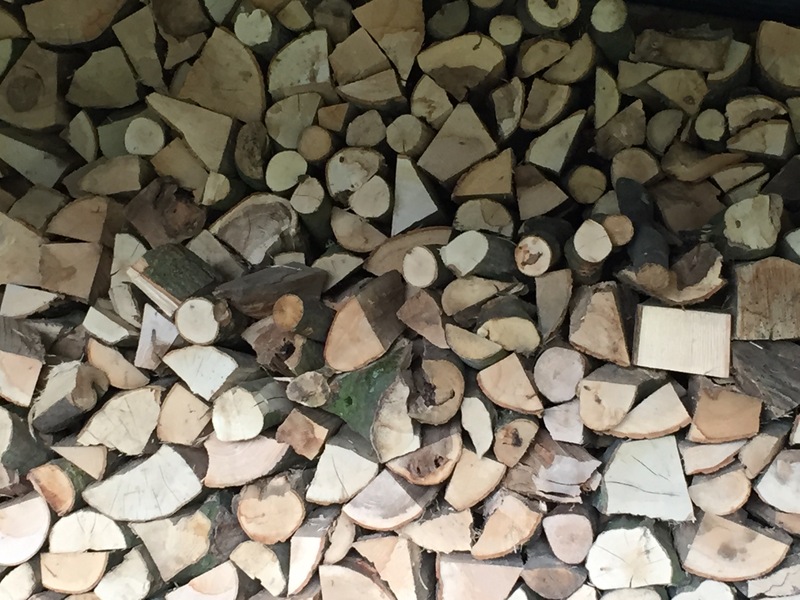 Just the thing for James after a day stacking logs ready for autumn. All thoughts of breeding chickens (crossing our Araucanas with Ixworths) have been put on hold until our nine-week old baby Charlie is a little older. This little chick needs all the time I have at the moment. Is anyone plotting some projects for the autumn? Happy weekends all!